Richard Rawlings is the owner of Gas Monkey Garage, a fairly well-known hot rod shop. Gas Monkey Garage frequents popular hot rod events, and also had scheduled appearances on hot rod-themed television shows,2 such as Overhaulin' on The Learning Channel. To make parody comics of the Anti-Christ of the Hot Rod World video, check out The SpankMaker. One of the forums that was spammed was the Hotrodders Bulletin Board, a large forum for hot rod enthusiasts located on Hotrodders.com. The members of the Hotrodders Bulletin Board immediately rejected the promotion, and appealed to SEMA and the television networks. 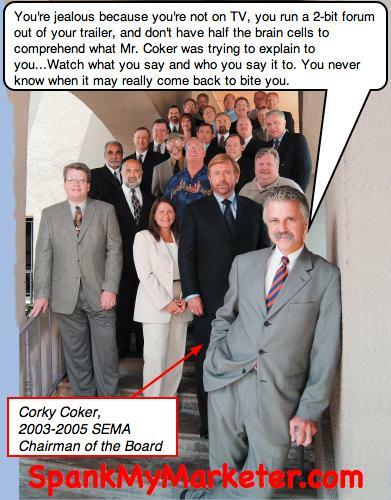 To handle the situation, Corky Coker, the outgoing SEMA Chairman of the Board, was dispatched to the Hotrodders Bulletin Board. Coker registered a username on the forums, and posted publicly in defense of the Spank My Monkey marketing campaign. To make parody comics of SEMA, the Specialty Equipment Market Association, check out The SpankMaker. Before the failed marketing campaign, Richard Rawlings had the backing of many facets of the industry. He had large companies as sponsors, he was a spokesman for The Bullrun rally, he was scheduled to do a car giveaway at SEMA, and he was being featured on popular hotrodding shows on television. Gas Monkey Garage Events. GasMonkeyGarage.com. Retrieved Dec. 17, 2006 from http://gasmonkeygarage.com/monkey_content.html. Gas Monkey Garage. GasMonkeyGarage.com. Retrieved Dec. 17, 2006 from http://gasmonkeygarage.com/monkey_content.html. Rawlings, Richard. About Me. GasMonkeyBlog.com. Retrieved Dec. 17, 2006 from http://gasmonkeyblog.com/about.html. Coker, Corky (Aug. 26, 2006). Gas Monkey Garage is giving away a Hot Rod -- need your help. Hotrodders Bulletin Board. Retrieved Dec. 17, 2006 from http://www.hotrodders.com/forum/gas-monkey-garage-giving-away-hot-rod-need-your-help-96191-11.html#post682189. Coker Tire (Aug. 28, 2006). Gas Monkey Garage is giving away a Hot Rod -- need your help. Hotrodders Bulletin Board. Retrieved Dec. 17, 2006 from http://www.hotrodders.com/forum/gas-monkey-garage-giving-away-hot-rod-need-your-help-96191-12.html#post682919. Hotrodders.com (Aug. 298, 2006). Gas Monkey Garage is giving away a Hot Rod -- need your help. Hotrodders Bulletin Board. Retrieved Dec. 17, 2006 from http://www.hotrodders.com/forum/gas-monkey-garage-giving-away-hot-rod-need-your-help-96191-12.html#post682929. Coker, Corky (Aug. 29, 2006). Gas Monkey Garage is giving away a Hot Rod -- need your help. Hotrodders Bulletin Board. Retrieved Dec. 17, 2006 from http://www.hotrodders.com/forum/gas-monkey-garage-giving-away-hot-rod-need-your-help-96191-15.html#post683874.